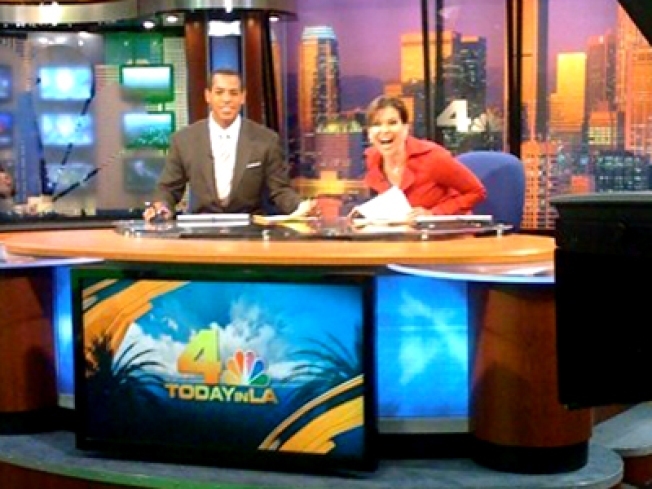 April 13: What's Jen Clicking on Between Newscasts? One of my favorite traditions is opening day at Dodger Stadium. No, not for me ... I don't go. Our morning reporter Robert Kovacik does, every year, and gets us all worked up over the upcoming season. In years past, Robert would barrage us with Dodger trivia, asking us a question before his report and then seeing if we could come up with the answer by the time he was done. Well of COURSE we cheated, seeing as I am a fast Googler, and Robert, let's face it ... Robert can spin a yarn all right. He's quit with the trivia (did you know the Dodgers got their name from having to 'dodge' trolleys on their way to the ballpark, risking life and limb, when they were in Brooklyn? I didn't, but I Googled it) because of the rampant and quite obvious cheating ("...Hey Robert we totally cheated and Googled that, but here's the answer..." was the dead giveaway) but one thing he will never stop with is the Dodger dog. 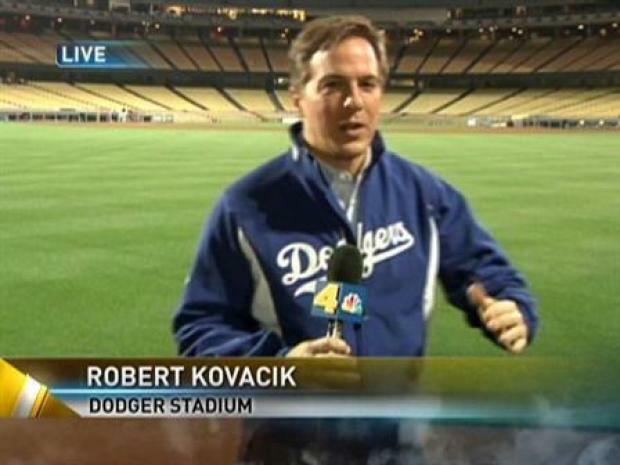 Robert Kovacik reports live from inside Dodger Stadium as dawn breaks on opening day. Love 'em or hate 'em, (and yes, even the ones at Costco are better, and oh so much cheaper) THIS is what you eat when you go to a baseball game. A Dodger dog, maybe a pretzel with mustard, or a malt ... one of those Carnation frozen deals that's so brick-hard it breaks the little wooden spoon it comes with. (You didn't really want to use that little spoon and get splinters on your mouth anyway, did you? Or, as Paul Johnson (freshly sunburned from yesterday's Angel's game ... look for his entire face to start peeling off by Wednesday) says, "Just have some peanuts." Why the vehement support for ballparky food? Robert had to bring up some new menu items available at Dodger Stadium today. You can get a greek salad at the game, or a Turkey pita thing, and I think he said something about a fruit and yogurt parfait. Now, I'm one of those scrambled egg-whites, dressing-on-the-side-please people. But when I'm going to a baseball game, I'm eating a hot dog. It's tradition. There's nothing about chicken pitas with hummus or salads with lite dressing in that song they sing during the 7th inning stretch. As much disdain as there is, generally, for the Dodger dog, and the relatively flat beer you typically expect in a ballpark, doesn't everything just taste better when you're at a game? I offer as evidence the nachos with yellow plastic melted cheese and anemic jalapenos that I craved at every college basketball game I ever went to ... best food ever. Which is why people will eat hot dogs at baseball games when they wouldn't eat one anywhere else. It's not because it's the only thing there. It's just a sort of traditional duty. Why else would they sell so many, when there are so many other options? ...$4.75 for an all-beef Dodger dog. When I asked what was in the inexpensive dog, the guy said, "Bits and pieces of toes, fingernails, and stuff you don’t want to eat." I made a few nasty expressions, then said, "You sold me. I’ll take the all-beef please." I don't want to know what dog it is, and I don't know how much it costs for real (the above post is from a few years ago) because Robert buys them and brings them back to the station after his opening day liveshots. It's tradition. I'll go back to turkey pitas and greek salads (dressing on the side, please!) tomorrow.